Cadbury's new creation can withstand tropical temperatures for hours. The beautiful thing about science is that it has applications in every walk of life. Want to send a man to the moon? Get thee to an astrophysicist. Need help curing cancer? A friendly molecular biologist might have some tips. Are you really upset that your chocolate bar keeps melting before you can sink your teeth into its luscious, velvety exterior? Cadbury's got you covered. The British confectioner has created a kind of chocolate that can last for hours in tropical temperatures, without any unappetizing drawbacks. Chocolate - especially milk chocolate - gets its distinctive flavor from cocoa butter, a fat that melts at around 95Â° F. Since the average human mouth is about 98Â° F, this means that chocolate will melt during its consumption, making for a tasty, textured treat. The downside, of course, is that many places on Earth exceed 95Â° F on a regular basis. A chocolate bar in a hot place will often become a congealed mass of goo long before reaching its target's mouth. By refining its products just after a process known as "conching," Cadbury has created a chocolate bar that can withstand a temperature of 104Â° F for up to three hours at a time. The precise mechanics of conching still puzzle food scientists, but the process aerates the chocolate, redistributes the fat particles, reduces acidity, and removes moisture. Conching can be time-consuming, but actually has a positive effect on the final product's flavor and aroma in addition to its heat resistance. Heat-resistant chocolate has actually been around since the 1930s, when scientists developed a nutritious chocolate bar that soldiers serving in tropical areas could consume. Similar confections accompanied the Apollo 15 astronauts to the moon, and the U.S. military to the Gulf War. Historically, these sweets had to be mixed with fillers like flour, fats, or even water, which lent them a waxy taste and gritty texture. 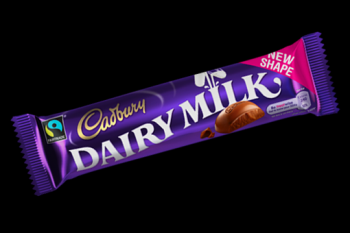 Cadbury hopes to sell its new product in tropical markets, where consuming chocolate bars outside has traditionally been a short-lived proposition. However, even temperate zones could benefit from this advancement, as anyone who's ever left a candy bar out on the counter during the summer can attest. Now if food scientists could figure out a way to prevent crisped rice from going stale, we'll really be in business.